US Department of Labor, Mine Safety and Health Administration, Coal Fatal Alert Bulletins and Investigation Reports, http://www.msha.gov/fatals/fabc.htm。. Alison D. Morantz, Mining Mining Data: Bringing Empirical Analysis to Bear on the Regulation of Safety and Health in U.S. Mining, 111 W. Va. L. Rev. 45-47 (2008). MICHAEL J. BRNICH, JR. & KATHLEEN M. KOWALSKI-TRAFKOFKER, UNDERGROUND COAL MINE DISASTERS 1900–2010: EVENTS, RESPONSES, AND A LOOK TO THE FUTURE 2, available at http://www.cdc.gov/NIOSH/mining/pubs/pdfs/ucmdn.pdf. The Bureau of Mines Organic Act, Pub. L. No. 61-179, 36 Stat. 369 (1910). MICHAEL J. BRNICH, JR. & KATHLEEN M. KOWALSKI-TRAFKOFKER, UNDERGROUND COAL MINE DISASTERS 1900–2010: EVENTS, RESPONSES, AND A LOOK TO THE FUTURE 65. Anne Marie Lofaso, What We Owe Our Coal Miners, 5 Harv. L. & Pol’y Rev. 97 (2011). Mine Safety and Health Administration, U.S. Dep’t of Labor, History of Mine Safety and Health Legislation, http://www.msha.gov/MSHAINFO/MSHAINF2.HTM. 33 USC. Sections 801 et. seq. 30 U.S.C. § 813 (2006). Mark Guarino, West Virginia disaster: Will Congress take on coal mining companies? The Christian Science Monitor, April 7, 2010. United States Department of Labor, Mine Safety and Health Administration’s StatutoryFunctions, http://www.msha.gov/INFO/INF1.HTM. 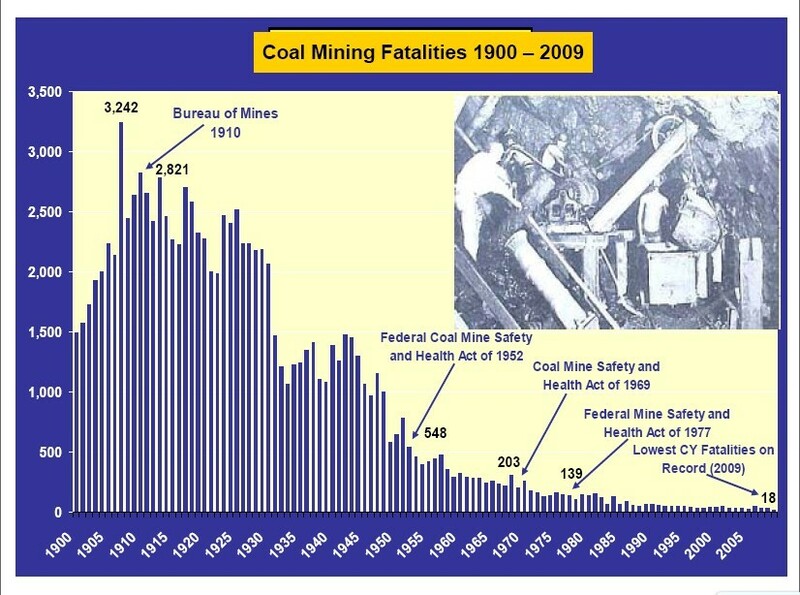 Coal Mine Safety and Health, http://www.msha.gov/PROGRAMS/COAL.HTM. 根据MSHA的说明，公然违法是指故意或者多次不采取合理措施消除已经明确的违反健康或者安全标准的行为，并且很大程度上或者相当程度上，或者可以被合理预期造成人员死亡或者重大伤害的行为。30 C.F.R. § 100.5 (e) (2010). Ken Ward Jr., Flagrant Violations: Is MSHA Using All of Its Tools?, Coal Tattoo, Charleston Gazette (Mar. 31, 2011), http://blogs.wvgazette.com/coaltattoo/2011/03/31/flagrant-violations-is-msha-using-all-of-its-tools/. "Fatal Underground Mine Explosion, April 5, 2010". Performance Coal Company Upper Big Branch Mine-South Massey Energy Company Mine ID: 46-08436:. Mine Safety and Health Administration. December 6, 2011. http://www.msha.gov/PerformanceCoal/PerformanceCoal.asp. Black Lung, United Mine Workers of America, http://www.umwa.org/?q=content/black-lung. 30 U.S.C. 817 (a) (2006). See Jim Fink, Massey Energy: A Dirty Coal Company, Investing Daily (Apr. 7, 2010), http://www.investingdaily.com/10902/massey-energy-a-dirty-coal-company. 有学者对美国煤炭企业中成立工会和矿难事故关系进行了分析，发现成立工会的煤炭企业发生事故的概率要明显低于未成立工会的企业。See Anne Marie Lofaso, What We Owe Our Coal Miners, 5 Harv. L. & Pol’y Rev. 106-113 (2011). 30 U.S.C. § 820(a), (d) (2006). 30 U.S.C. § 818 (2006). "Alpha Natural Resources Inc. and Department of Justice Reach $209 Million Agreement Related to Upper Big Branch Mine Explosion" (Press release). US Dept. of Justice. December 6, 2011, http://www.justice.gov/opa/pr/2011/December/11-ag-1577.html. U.S. Department of Labor Mine Safety and Health Administration National Mine Health and Safety Academy, Courses for MSHA and the Mining Industry (FY 2012), http://www.msha.gov/training/cat.htm. 30 CFR parts 46, 48, 49, 56, 75 and 77. Cynthia wildfire, Mine Safety: Penalty Structure and Enforcement Mechanisms of the Mine Act in the Wake of the Upper Big Branch Explosion, 64 Admin. L. Rev.451 (2012). John Braithwaite, To Punish or Persuade: Enforcement of Coal Mine Safety (State University of New York Press, 1985), pp.4-13.